If you’ve given Sprout Social’s 30-day trial a spin, you’ve likely spoken with a Product Specialist. These experts are a vital part of our team, helping organizations large and small find the right social media management solutions for their business. Alison Garber serves as a Senior Product Specialist for the corporate sector here at Sprout, and in this role, she handles inquiries from organizations of 50 or more employees. Alison started her career in the nonprofit world, then transitioned to a sales role in traditional media before joining Team Sprout—bringing with her a natural curiosity and desire to help others. Read on to learn more about Alison’s career transition, thoughts on culture and top item on her bucket list. You started at Sprout in April 2014—can you tell me about your career path so far? Everybody in my family has been in sales. I was the black sheep of the family, because my undergraduate major was in public policy, and I worked in the nonprofit sector. I really wanted to effect change: I worked at a political action committee, then at a women’s foundation and it was awesome. After a while, I got to the point where it was time to move on and try something new. I had a connection to someone at a PR agency where I had interned when I was younger, and I ended up joining them and working in sales. I was doing outbound sales, or cold calling, for our public relations and media services. Were there skills and experiences from the nonprofit world that transitioned to your role in sales? The connection between the two comes down to helping people, whether you’re working in the nonprofit space or as a consultant in the for-profit space. You’re really trying to be of service to somebody. You’re listening to what challenges this person might be facing and you’re trying to come up with a viable solution that works for that person, team and organization. It was a very natural progression for me to move from working for a nonprofit to working with people in a different capacity. Going from PR—traditional media—to social media seemed like a natural progression. I loved the way Sprout’s culture seemed from the online application. The questions were interesting and challenging. How does the corporate team approach the sales process? Our team handles organizations with 50 or more employees, and the kind of conversations we have are a lot more consultative. Often people who are trying Sprout are already familiar with social media management platforms, and they’re coming to us because they have very specific pain points. Working with them is a matter of helping them uncover what their needs and problems are and how we could provide a solution. The best kind of initial call should be conversational—talking about what brought you to Sprout Social and what problems you’re trying to solve and keeping the discussion somewhat open ended. As you continue to explore, then you can really roll up your sleeves and figure out what you’re looking for specifically—what features and functionality will help you do your job better. What trends have you seen in what customers are looking for in a social media management tool? When it comes to social customer care, everybody’s looking for context. It’s very rewarding to be able to talk about how we offer that conversation management piece—that social CRM with full conversation history. It’s even more exciting with the new Twitter data partnership, since we can give customers access to even more historical data that’s important for social care. Our ease of use is an asset as well, especially for customers who have large teams and an increasing volume of inbound messages. It’s rewarding to talk with people as they get started in Sprout and watch the lightbulb go off. When they have questions, customers also want to have the safety and security of knowing they can speak to somebody on our support team right away. You don’t have to be an enterprise social media customer to be directly connected to someone, so that’s really valuable. What do you find most fulfilling about your role? The fulfilling part is being able to be of service to people. It’s rewarding to see that the platform is such a helpful tool in people’s day-to-day professional lives. Everyone wants that ROI—everyone wants to see what’s resonating, what’s working and what’s not. Our app is designed to simplify that process. Our reports extract the most helpful metrics so you can modify your social programs based on the data we’re providing. We don’t give you all the numbers under the sun—we give you the important information so you can make decisions that directly benefit your business. How would you describe the culture on the sales team at Sprout? The people here are just amazing. It’s fun to have that camaraderie. Oftentimes in sales, you have a designated territory, and it can feel as if you’re working in a silo. At Sprout, because our team handles inbound sales, we aren’t competing against each other. We help each other strategize, we help answer product questions, and we benefit from each other’s experiences. 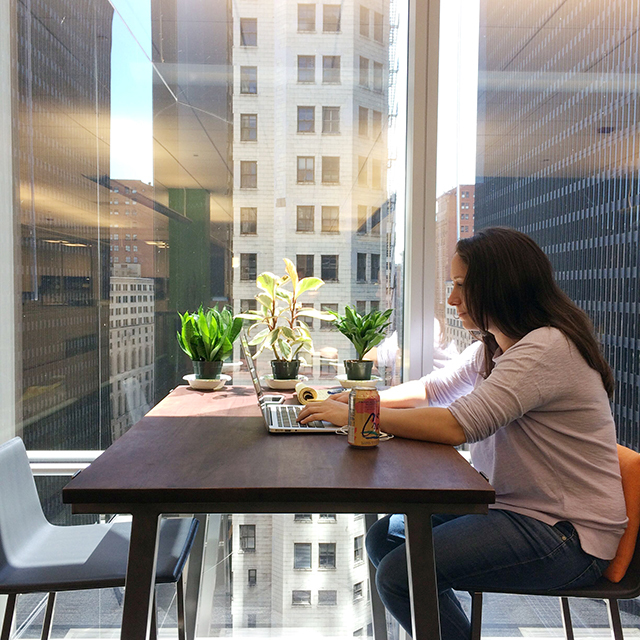 I see you all around the office—where’s your favorite place to work in Sprout HQ? I bounce around so much. I’m never in one place for long, but my favorite spot is the high-top tables. The sun beams through, I can put my feet up, and it’s nice and quiet, but I can still hear my phone ring and run over to get it. I love the outdoors, and I love live music. Ravinia is one of my favorite places to go in the summer. I also love to travel, and my bucket list includes a lot of hikes. Climbing Machu Picchu is next on my list. So beyond, perhaps, the ability to fly anywhere in the world, what would you want your superpower to be? Probably time travel. I’d love to see what it’s like in the medieval times—it wasn’t a great time to live as a woman, but it would be so interesting. Or to see what it’s going to be like in the next 100 or 200 years. What advice would you give someone looking to join Team Sprout? Having a genuine curiosity has really helped me in my career; it creates a sincerity that I think comes across on the phone when I’m speaking to potential customers. You have to be inquisitive and eager to learn about their use case, not just trying to get a deal in the books. That type of personality will help you in terms of sales, in terms of retention and in terms of culture. If you really care about the product, and you’re interested in working an environment with a variety of different sales teams—sales development, inbound sales, customer success—you should definitely join Team Sprout.